Admit it: The Backstreet Boys were once your fire, your one desire. Believe when I say that I wanted it that way. Backstreet Boys music videos were everything in the late '90s, and early '00s, for more than just the fact that, y'know, the Backstreet Boys starred in them: Specifically, they experimented a ton with the music video format in a time when it was still rather new to the industry. Much of the time, the Backstreet Boys' videos utilized the gang's good looks, particularly relying on Nick and Howie's boyish charms — but they also pushed the technology factor as far as it could go in the decade. Like so many videos from this time, the Backstreet Boys filmed space epics, got creative with flashing lights, and featured all sorts of themed dance clubs. But, which Backstreet Boys music video is the best? As a former BSB fanatic, I realized I had to figure it out; so, I sat and watched every single music video they ever recorded — every. Single. One — to take a look at which video is truly the ultimate. Trust me, it was a educational experience. Though, the video almost always had nothing to do with the lyrics of the songs, it's always great to sit back and watch the dichotomy of various romantic ballads taking place in random places like an airplane hanger or in the middle of an audition for a play. Revisiting these videos is revisiting your childhood, as well as celebrating how much smarter you are now that the total incongruity of what you are seeing vs. what you are hearing bugs you. This isn't a music video as much as it is a concert video, so I am dubious about its place in the canon. As you go down the list, you'll see how they can do much, much better. The good ol' standing and brooding — this video has nothing interesting to offer. 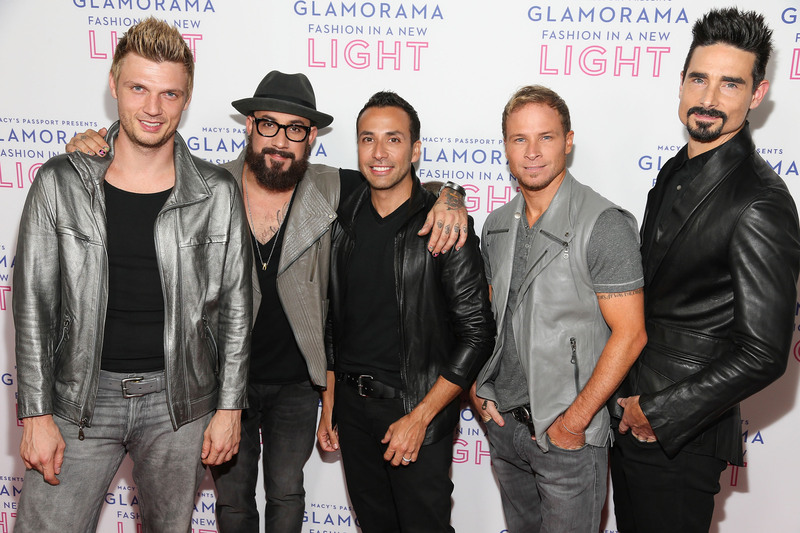 They're outfits don't match, so is it really even the Backstreet Boys? 22. "Straight Through My Heart"
This one never lives up to its bizarre, pretentious title card about "Vampires who hunt for prey at bars and nightclubs." Also, all the flashing lights make it kind of nauseating to watch. This sort of looks like a bunch of frat bros on a Spring Break tour, being bros and sucking at karaoke despite being a boy band. No thanks. 20. "Helpless When She Smiles"
This one — even moreso than the other Backstreet Boys songs — makes me uncomfortable when I realize that these five dudes are all pining for the same girl. This can't end well. Higher up on the list, "Inconsolable" plays just like an episode of The O.C., with Nick looking all sad like Seth Cohen and Howie all brooding like Ryan Atwood. Though the title is artsy with the ellipsis, the music video is nothing special. 17. "Show 'Em (What You're Made Of)"
This one is from the Backstreet Boys' 2013 attempt at a renaissance. Considering most of them aged well — Howie and Nick are as hot as ever — it will make you wish it were 1998 again. 16. "Just Want You to Know (Sphynkter Version)"
"Sphynkter Version." Why? What is this? Why are we here? Who are you? This one will launch an existential crisis. The "moody in the desert" and "crying on the highway" thing is great, but Enrique Iglesias' "Hero" video does it better. A great subliminal advertisement for the Grand Canyon, and also a solid music video. 13. "Shape of My Heart"
The premise that the guys are auditioning is meta and strange, and has nothing to do with the song. Plus, the blue tint is distracting. 12. "All I Have to Give"
This one offers nothing new to the Backstreet Boys canon, but good song. 11. "I Want It That Way"
This one will take you straight back to 1998. While it is without a doubt the band's most iconic song, the music video is tragically basic. We just see them sing in all-white at an airport, and show off their private jet. Disappointing. 10. "Get Down (You're The One For Me)"
This one is their most aesthetically ambitious — we got the modern funky screen thing going on. It kind of looks like they're in the midst of a security office with a lot of surveillance screens, but it works with their energetic choreography. Plus, this one gets pity points for Nick's horrible haircut. 9. "Show Me The Meaning Of Being Lonely"
This one is too real with its depiction of the boys grieving loved ones. Howie definitely deserves an Oscar for his sensitive performance. 8. "We've Got It Goin' On"
"What's up, what's up!" These guys hilariously introduce themselves is a weird, pseudo-smooth way which is clearly what Justin Bieber has been basing his voice on all these years. This one gets points for the hilarious introduction, and the multiple locations which include a club, a forest, and a basketball court. An epic journey through the galaxy, starting with a tease of all previous BSB hits? This one is a winner — but it takes too long to get to the dancing and barely shows the boys. 6. "As Long As You Love Me"
Hot female business executives interrupting a weird indoor basketball game/audition montage? This one is bizarre, but ridiculously fun to watch. Hot beach party. HOT. BEACH. PARTY. It's just so full of valuable life lessons — and you gotta love that glimpse at '00s phones. 3. "I'll Never Break Your Heart"
Dat intro, tho! There is nothing better than a space age-esque runway with shots of the Backstreet Boys one-by-one, along with the dialogue, "Baby, I know you're hurting. Right now you feel like you'll never love again. All I ask, is for a chance." This one has a plot much like The Rocky Horror Picture Show: The boys' car breaks down, and they go to this abandoned mansion. It is an incredible Halloween display that doesn't seem to have anything to do with the song... and it is magical anyway. 1. "Quit Playing Games (With My Heart)"
Simple and sensitive. While there aren't high production values, the boys just look so lovably earnest and really capture that Boy Band vibe that made them who they are. This vid is number one, always and forever. Watching all 24 of these music videos was like reliving my childhood, and all the accompanying emotions. who else misses the good old days of BSB? !